St Frances Academy and Gilman School were among the big storylines of the 2017 football season. After one of its worst seasons the year before, the Greyhounds enjoyed a turnaround this fall. Meanwhile, the Panthers had one of the most impressive showings in recent memory. No player was more dominant at this position than defensive end Eyabi Anoma. The St. Frances senior is VSN’s Defensive Player of the Year. 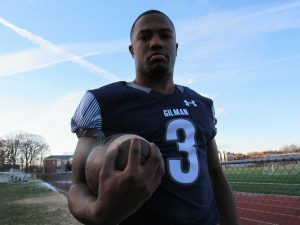 Brandon Madison was the spark behind Gilman’s return to the area’s elite. The senior running back is VSN’s Offensive Player of the Year. Lawrence Smith helped guide Dunbar back to championship status while Harford Tech enjoyed its finest season under first-year coach Tim Palmer. Palmer and Smith are VSN’s co-Coaches of the Year. Madison capped his topsy-turvy Gilman varsity football career on a high note. 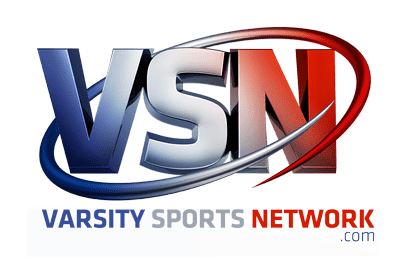 The senior is VSN’s Offensive Player of the Year. The versatile 5-foot-11, 200-pound running back accounted for 1,812 yards for the Greyhounds, who reached the MIAA A Conference title game. He rushed for 1,265 yards and 13 touchdowns and caught 36 passes for 430 yards and a touchdown. Madison, who also had a kickoff return for a touchdown (117 kickoff return yards), threw a touchdown pass in the MIAA A final where Gilman lost to nationally-ranked and area’s No. 1 St. Frances Academy. After a 0-3 start, Madison and the Greyhounds (5-7 overall) defeated McDonogh School in the annual season-ending rivalry match to secure a spot in the league postseason tournament. Madison said the turnaround started with a victory in the closing seconds over Calvert Hall College in October. A reserve on the 2015 MIAA A championship Greyhound team, considered the best in school history, Madison and Gilman struggled to a 2-9 showing in 2016. One of a handful of players who stayed at Gilman after most of the football staff departed for St. Frances Academy in January 2016, Madison’s leadership along with co-captains Piper Bond, Thomas Booker and Brandon Willis helped steady the Greyhound program. A three-sport athlete (basketball and track), Madison was an all-MIAA A football selection and was selected to play in the Crab Bowl. He holds a scholarship offer from Army, Howard and Navy and has interested from several Ivy and Patriot league programs. Eyabi Anoma was the proverbial eye of a storm that was the 2017 St. Frances Academy football team. The senior end is VSN’s Defensive Player of the Year. Anoma had 100 tackles, 25 quarterback sacks and five forced fumbles for the No. 1 Panthers, who claimed a second straight MIAA A Conference championship. After a somewhat surprising run in 2016, the east Baltimore school was a model of dominance from week one. It started with the 6-foot-5, 240-pound Anoma, who left opposing players and coaches in awe of his speed, sheer athleticism and high work rate. “He’s just tremendous,” said Gilman coach Tim Holley. After Gilman scored a touchdown on the game’s opening drive in the MIAA A final, the Panthers suffocated the Greyhounds, allowing one first down in the second half in a 44-7 decision. The other time St. Frances trailed this season was at Archbishop Spalding, prompting Anoma to gather his teammates. The Panthers, currently ranked 11th nationally by USA Today, won 42-7. “Eyabi got on us and told us we got to step up,” said St. Frances junior quarterback Jalon Jones. The Panthers allowed 65 points during the season including 50 (including playoffs) in the MIAA A, the area’s premier conference. Before receiving the VSN honor, Anoma, the nation’s No. 2 defensive end by ESPN (4th-ranked player overall), said his defensive teammates deserve the accolades. A transfer from Randallstown where he played basketball, Anoma was coaxed into trying football. Used to doing his “own thing,” Anoma was benched by the new St. Frances coaching staff. Panthers co-coach Henry Russell saw Anoma’s potential during a satellite camp last summer. Anoma, who hold scholarship offers from nearly every Power 5 programs including Alabama, Florida, LSU, Maryland, Mississippi State and Ohio State, said he will sign this week during the first early national signing period. Saturday, he will lead the Panthers against Utah state champ Bingham (ranked No. 3 nationally by USA Today) in the Geico State Champions Bowl Series in Phoenix. An all-MIAA A selection, Anoma will play in the Under Armour All-America contest in Orlando on Jan. 4. Palmer helped orchestrate one of the biggest surprises of the 2017 season. The first-year coach is VSN’s Co-Coach of the Year. Harford Tech won a school-record 12 games and had its first undefeated regular season. The Bel Air school lost to Prince George’s County’s Gwynn Park in the Class 2A state semifinals. The Cobras, who went 5-5 in 2016, previously had a winning season in 2008. Harford Tech, which never won more than six games in a season, reached the state postseason for the first time in 2017. Palmer, who coached the Cobra junior varsity in 2013 and 2014 before moving to Joppatowne to serve as varsity offensive coordinator in 2015 and 2016, knew Harford Tech was ready for a breakthrough. The Cobras, who finished 12th in the final VSN Top 20 poll, won the UCBAC Susquehanna championship. Harford Tech defeated Elkton, last year’s 2A state finalist, and rallied past Kent Island to win its first region title (East). Palmer said the Cobra seniors, who he coached as freshmen on the junior varsity, “set the tone,” for their successful final season. He also credited his staff featuring Ja’Juan Burrell, Dan Culver, Isaiah Gills, Brad Hunt, Anthony Ingoglia, Mike Kelly, Ricky Patricio, Mark Pippen and Kenny Williams. Smith guided the Baltimore City school back to prominence in 2017. The veteran coach is VSN’s Co-Coach of the Year. The Poets won their first state championship since 2014, defeating western Maryland power Fort Hill in the Class 1A final at Navy-Marine Corps Stadium. Last year, the Orleans Street school lost in the 2A state semifinal to eventual state champ Walkersville from Frederick County. Dunbar lost its 2017 opener at Allegany in Cumberland. Smith challenged his veteran squad. The Poets (12-1 overall) won their final 12 decisions, including a victory over then three-time defending Baltimore City Division I champ Mervo. The Mustangs, who narrowly missed the 4A state playoffs, had beaten Dunbar the prior three meetings. Dunbar (No. 8 in final VSN Top 20) went on to claim the city Division I title (first league title since 2014), and defeated Division II champ and unbeaten Reginald Lewis in the 1A North Region final. The Poets knocked off Havre de Grace, which reached the 1A state final in 2015 and 2016, in the state semifinals. In the state final, Dunbar overtooked Fort Hill, 30-26, denying the Cumberland school a record fifth straight championship. It was the Poets’ area and state-record 10th title. It was the sixth for Smith, a 1992 Dunbar graduate who played for the late Pete Pompey. He credited his coaching staff including Nathaniel Bond, Michael Carter Sr., Michael Carter Jr., Travon Garrett, Rodney Goggins, Christian Golder, John Gross, Tyrone Johnson, Brian Phillips, Charmone Vaughn, Christopher Wainwright and Joseph Wright. Smith said he’s trying to maintain the Poet football tradition established by predecessors Ben Eaton, Stan Mitchell, Pompey and Bob Wade as well the players who helped Dunbar become the first Baltimore City program to win a state title in the mid-1990s. “When people look at the stadium and the type of program we have now, that’s blood, sweat and tears from those guys,” said Smith. Smith joined Poets’ coaching staff in 2001 as offensive line coach under Eaton, who suddenly passed away before the start of preseason practice in August 2007. In 10 seasons, Smith is 120-16 with six state titles, nine region championships and seven Baltimore City titles.